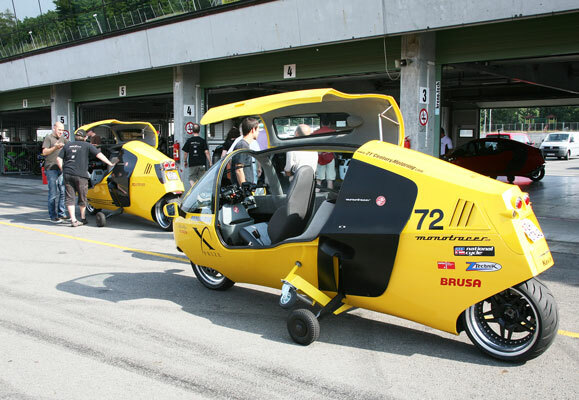 Both of the first two Electric MonoTracers were at the annual Peraves Brno gathering in July 2011. These are the machines which won their class and $2.5million in the previous year's Automotive X-prize in Michigan. No.72 is the Brusa-powered machine which was first built in 2009; the second No.79 machine is fitted with the more powerful (150kw=200+bhp) AC Propulsion electric motor which was also used in the first Tesla sports car. But the MonoTracer weighs about a third as much as the car, so accelerates a lot quicker, like a drag bike!